The sculpture, dubbed “Space Glow,” is the second piece of public art to be featured at that location. It replaces “Heartfullness,” a welded-steel sculpture shaped like a heart by Katy Boynton, and will be on display for two years. Patricia Vader of Martinez and Joe Bologna of Alamo. 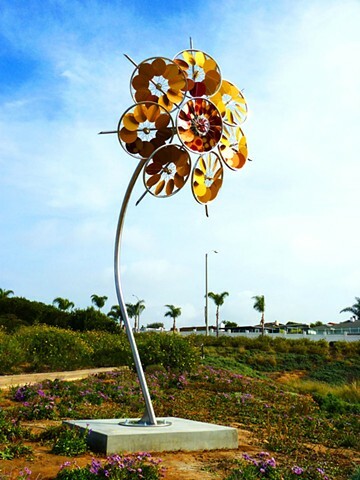 In sunlight, the sculpture resembles a metallic bouquet with aluminum colanders, bike rims and stainless steel cutlery holders forming the body and flower petals. The petals are attached to flexible conduit stems mounted on a rusty water heater base with attached fins, which make it look like a rocket. At night the sculpture’s flowers glow in five LED colors, giving the work an otherworldly aura. “In our vision it was something that came flying in from outer space and kind of stationed itself,” Vader said in an interview last week. 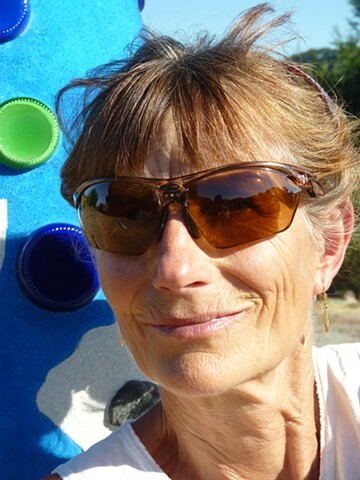 Vader said she and Bologna created the piece over the course of a few months in 2015 and previously displayed it at the Ruth Bancroft Garden in Walnut Creek. In its call for artists’ submissions last fall, the Fremont Art Review Board chose a theme of metamorphosis to represent the changes transforming downtown into a vibrant social gathering hub. Vader said she hopes people will see the sculpture as a playful piece of art. “With the lights on, those are quite spectacular at night because it glows in those aluminum colanders, so I hope it just gives them a little pang of joy in looking at it,” she said. “Space Glow” beat out 19 other art submissions, although another Vader work called “Butterfly” was picked as an alternate in case the Fremont City Council isn’t sold on it. Vader said she believes public art not only enhances a city’s physical space but also can serve as an economic driver by attracting residents and visitors. She added that such conspicuous installations can bring people closer to art in their daily lives. “It allows people to develop maybe a different way of looking at things, and enjoying them,” she said. The city will pay the artists a total of $5,000 in quarterly installments over two years. The interview concludes the article Did You Know Newport Beach Has a Sculpture Garden? On May 27 2016, after installing SIT at the Children's Museum, I was interviewed (video) by Rachel Hanson of the Lafayette Cultural Resources Division. Exuberant is the best word to describe the magical, chaotic, rarely stationary sculptures of Patricia Vader. Born and raised in the Netherlands, Vader brings aspects of her native country to her lively, motion-filled works: reclamation – not of land but materials, bicycles (“Like so many Dutch people I practically grew up riding one!”, she says), and windmills. Originally working as an astronomer after emigrating to the United States, the Ph.D. degree in mathematics and natural sciences she earned at the University of Amsterdam meant she was in front of a computer far too much. At least by her estimation. Putting together a portfolio that gained her entry (and a Masters degree) into the California College of the Arts in San Francisco, she has honed her expressive talent and creative zest ever since. 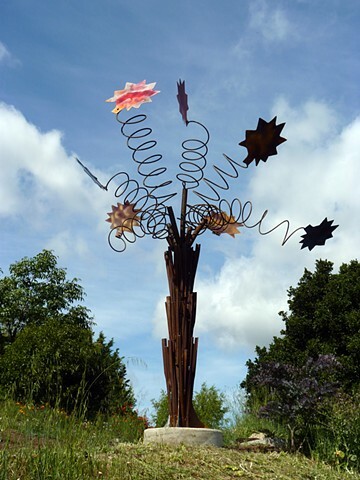 The 26- acre property she and her husband occupy in Martinez, California is awash with her wild, kinetic wind sculptures and even a few stationary ones. Vader creates ingeniously designed works of art that are often functional, and always an integral part of the fantastic landscape she inhabits. One of her pieces (Peacock) sits massively on her studio roof and acts as her own personal wind barometer - unlike any other assuredly! – while the whirring, hypnotic, motion-filled extravaganza that is The Interstellar Butterfly was a hit at the 2010 Burning Man festival. Corkscrew taps another favourite subject of Vader’s - cats. 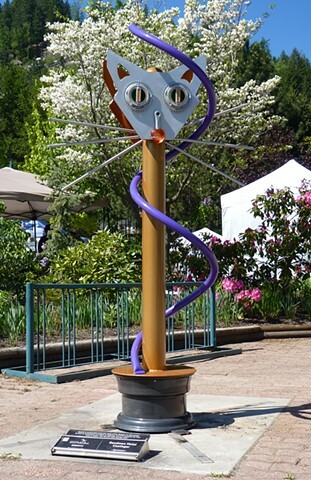 The simply styled metal head of a feline – big whiskers fanning out; red mouth below abstract eyes and nose – sits atop a steel post. A vibrant purple slender tail winds around the pole and above the face. It is simple, balanced and hugely engaging. Vader has incorporated cat sculptures into bridge supports; here she is thinking less of the functional and more of the pleasures of life – like fine wine. Always hugely inventive, Vader’s entry is just a hint at the complex creations her fertile mind conjures up continuously. Question 1: Where do you draw the inspiration for your sculptures, specifically this year’s entry? My inspiration is the fauna and flora, domestic and wild, in the coastal hills with grazing cattle of the San Francisco bay area where I live since 2001. In the first year all the fruit trees I planted were destroyed by gophers so I built up an army of cats, eleven of them at its peak, that keeps the gopher population almost extinct. The cats are very entertaining personalities that inspired “Corkscrew” and several other sculptures. Question 2: Which artist, past or present, has had a major impact on you as a sculptor and why? I looked a lot at the kinetic machine-like creations of Swiss sculptor Jean Tinguely whose imagination and humor are a source of energy and made my own first kinetic piece on a windy day, a bicycle wheel turned into a windmill. 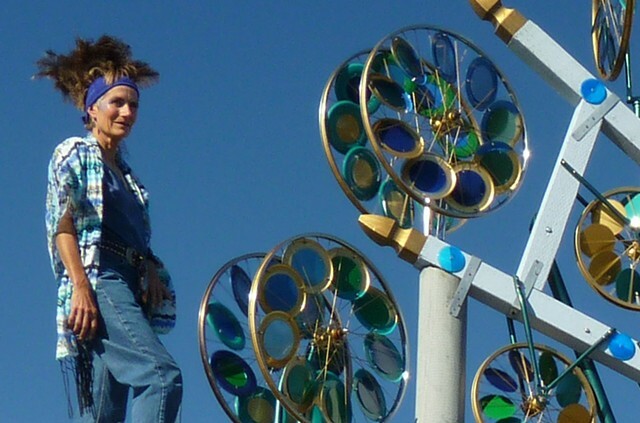 These windmills are now a signature component in my larger sculptures, public safety rules requiring moving parts to be at least seven feet above ground, while the smaller sculptures feature other bicycle parts, pointing to my origin as a Dutch girl practically born on a bicycle. Corkscrew has its share of them. Question 3: Was there a defining time or moment in your life when you realized sculpting was something you wanted to do for a living? My first career began at the university as a professional astronomer. When the omnipresence of computers started stifling my brain I found an outlet in photography and created a painting portfolio to be admitted in graduate school where I fell in love with sculpture. 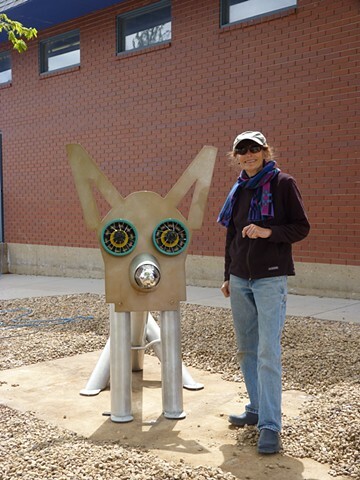 When I moved to a rural property the wide horizons called for large works and soon public art became my main interest. Question 4: Do you always utilize the same material(s) as this year’s piece, and why is it your preferred medium? Because they are strong and versatile metals are my preferred materials. I bolt them together as much as I can and have other professionals do the welding. Question 5: What is the importance of the arts in today’s society? It is wonderful to see how art is embraced today as a way to attract people to town and create a unique community signature. The more freely accessible public art there is, the more interested and delighted people are, which is the artist’s dream. Making art part of the landscape and everyday life is a visually and intellectually stimulating contribution to society. The road twisting through the Briones hills makes an unexpected sharp left, revealing an explosion of color and movement that ripples across the windswept hilltop. There is so much to see the eye cannot take it all in, not even after hours of looking. Sculptures of owls, bats, peacocks and rabbits sway, spin and move with the slightest breeze. The landscape is a riot of wildflowers and plants chosen by a daring heart that likes to experiment. And then there's the house, painted in so many different colors that if you were asked to name the dominant hue, you couldn't. Welcome to Patricia Vader's home. Vader, an astronomer-turned-wind artist, has transformed her 26-acre ranchero into a gallery for her art and whimsy. The house may have started its most recent transformation as white with a neatly shingled gray roof, but every inch of the exterior has become a canvas for Vader and her love of color and animals. The gable above the garage is painted with two whimsical frogs — homage to a family of real frogs she found one spring while replacing the gutters. The frogs perch above a yellow-green garage door decorated with elongated diamonds done in two shades of blue. A warm, sun-baked orange flanks the door. Around the corner, a long expanse of wall shows evidence of Vader's next project — a salute to her pet rabbits — sketched onto the wood siding and waiting for Vader to find the time to finish them. Vivid blocks of color adorn another stretch of wall. Scattered around the property are bits of ephemera. Bicycle wheels, castoff engine parts, stacks of discarded tiles, a skeletal connection of pipes that, when held at the right angle, conjure the image of a giant bird claw. What may seem like utter chaos is actually an oasis of calm and order, creating a feeling that everything is exactly where it should be, neat and tidy. All of the color should clash with the quickly browning hills, and yet there is only the sense that it is all part of the natural landscape. Whether that is Vader's goal is unclear, even to herself. The Dutch native surveys the space around her and a wide smile fills her face. "In Holland," she says, "we have a long history of reclaiming land. I think I must have the reclamation gene." Vader and her husband, an astronomer at UC Berkeley, moved to their hilltop home a few years ago as an escape. The couple had met in 1994 through their work. When their bicoastal romance became serious, Vader says, it became clear that one of them would have to move. Vader, who loves astronomy but hated the increasing time she spent parked at a computer, decided she would move West. They lived in Berkeley for a time, but Vader worried about their proximity to an earthquake fault. They began looking for property far enough from danger yet near enough to civilization. Their Martinez home was not their first choice. It was a property that would not attract many. Perched on top of a steep hill, it is baked by the sun and raked by the wind. The house was small and rundown, but Vader recognized the potential. What followed has been a nonstop quest to transform the property as well as the property owner. While remodeling the house and designing the expansive patio, Vader also was working on her artistic skills. She had long dabbled in painting and had explored other mediums, including photo collage and pottery. Her early work, displayed in her home, is a road map to her future — the paintings are rich with movement. Even her still lifes seem to move with the wind. It seemed logical that when she started studying sculpture, she would want to incorporate wind-generated movement in her work. The first step came one Christmas Day not long after the couple moved in. Vader spotted a small group of rabbits alongside the road. They seemed to have been someone's pets, abandoned in the hills. She passed them by, but kept thinking about them. She returned later and managed to capture three. "I didn't know anything about rabbits," Vader says. "We kept them in the bathtub for a while, and that was a disaster." Vader decided to build them a rabbit hutch, but it wouldn't be an ordinary one. By the time she had finished, with the help of a small Bobcat and a strong neighbor, she had erected a rabbit cathedral with a huge spoked open roof and a gate designed with metal scraps and fashioned into a large bunny. The cathedral, and the addition of more rabbits, launched her next project: a garden to grow fresh vegetables for the rabbits. The garden is now a small stadium of raised beds where she grows traditional vegetables and drought-resistant perennials, learning as she goes. As she perfected her sculpting techniques, she began experimenting with movement, using bicycle wheels and metal disks. Two donated radio dishes became a bat in flight. More found metal parts became owls that sway in the wind, their eyes glowing with solar lights. Her biggest project to date is a massive peacock built atop her large workshop and made of more than two dozen bicycle wheels and dozens more colorful disks. 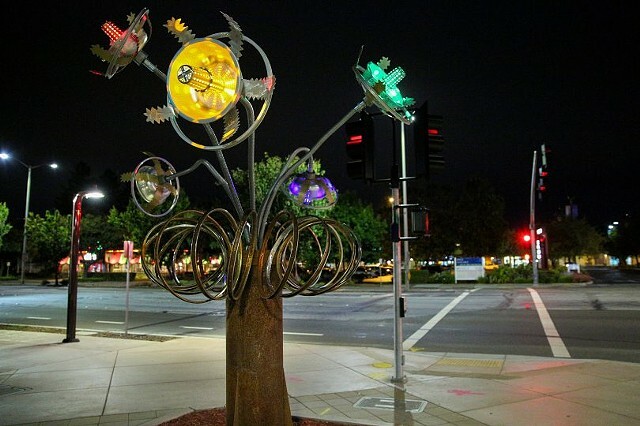 The peacock was a prototype for one she designed and built at the Orinda Plaza as part of the city's Art in Public Places program. "I've always liked bicycle wheels," Vader says, "and I wanted to use them somehow. I just had to figure out to make them spin in the wind. I guess it's a Dutch thing." Pleased with her peacock workshop, Vader next turned her attention to a doghouse for her two enthusiastic canines. The doghouse is designed with an owl theme, the owls made out of leftover bicycle parts. And to throw in some whimsy, a few windswept cats hang around, as well. A seemingly never-ending list of projects awaits her. She works throughout the year on her garden, both the tidy raised beds and the wild expanses of flowers that spill across the hillside. A drainage problem that could have been mended with a simple retaining wall took on a life of its own as Vader designed and built the wall, mixing the cement and studding the wall with bottles, salvaged railroad spikes and colorful tile. The wall serves its function, but artistically it is unfinished. Vader has been considering the problem, however, and thinks she knows what she wants to do. "You have to have the patience to let things wait," Vader says. "Take a while, leave it alone, and if you don't destroy it, the answer will eventually come to you." Her family isn't quite sure what to make of her. Her mother thinks she's from another planet, Vader says. Vader grew up in a home that valued education and music. Vader says while she simply wasn't gifted in music, she long harbored a love of art. Giving up astronomy wasn't easy, but she found solace in getting to explore art with unbridled passion. When Vader first moved to her Martinez property, there was so much she wanted to do. After years of marking things off her list, she has found more to add to it. That's how you fill up a lifetime. "You always have to do something," Vader says, "so you can move on to the next step and the next step and the next. Everything you do matters." “Het was een sprong in het zwarte gat, op mijn 43ste. Ik had nooit iets aan kunst gedaan. Ik begon met fotocollages. Nu maak ik van alles. Altijd groot, kleurrijk en figuratief en altijd komen er dieren in voor. In 2001 was ik bezig met een groot schilderij. Ik dacht dat ik een blauwe koe zou schilderen. Door de aanslag op het WTC werd het een woeste stier die door vleermuizen wordt geplaagd: George Bush, die de terroristen probeert te bestrijden. Afgelopen augustus installeerde ik mijn eerste openbare werk, in het stadje Orinda, een gigantische pauw van fietswielen. Mijn vader overleed een paar jaar voor ik kunstenares werd en dat maakte het makkelijker. Ik geloof dat hij het vreselijk had gevonden dat ik uit de academische wereld stapte. Hij heeft mij gepushed om sterrenkunde te doen, hij was zelf ingenieur. Ik heb zelf getwijfeld tussen psychiatrie of sterrenkunde. Ik promoveerde in Amsterdam. Normaal ben je na je promotie eerst postdoc, maar ik heb dat heerlijk overgeslagen. Ik kreeg een assistant-professorship in Yale. Ik heb dat aan mijzelf te danken, want ik heb twee keer in Amerika een colloquium gehouden en beide keren ontstond er een enorme discussie over mijn modellen van het melkwegstelsel. Ik hield voet bij stuk, en had gelijk. Zo kenden ze mij. Ik heb een heerlijke tijd gehad aan Yale in New Haven, een cultureel stadje, net zoiets als Groningen.